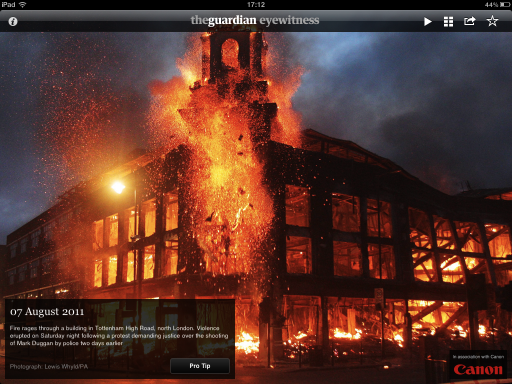 It was the day after the riots in London escalated and became international news. My student (in a one to one class) is an anglophile, having lived in London for a year, so there were was only one topic of conversation in that lesson. She’s an intelligent person who is prepared to speak about almost any subject and can really engage with meaty subjects. The conversation turned from what happened to how and why it happened. In my opinion, these are complex social matters that cannot be discussed glibly and I was delighted that we were able to have such a high level conversation. I made the point that I think there are some serious problems within British society that will take generations to solve, if the population is willing. Where the photos came in was that I was quickly and vividly able to illustrate my point. The first photo was taken during the riots, a stunning image that captures the intensity of what happened. 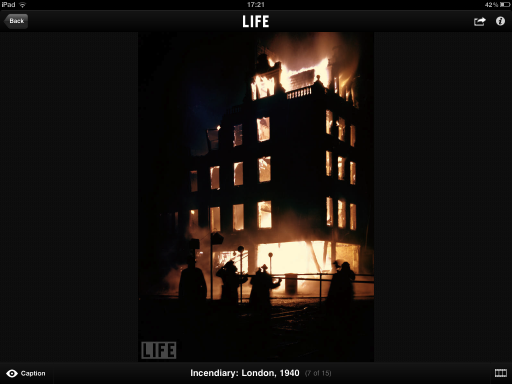 The second was taken in 1940 as London came under attack during the Second World War. The point I wanted to make with these similar images was that a huge project of rebuilding was undertaken with political consensus after the war, so there is no reason that it couldn’t be done again. I think that by using these similar images I was able to reinforce my point without needing to resort to rhetoric or time consuming online research. images can be compared to emphasise arguments, which could be the grounds for an interesting activity in the future. we don’t always have to think of these resources as the seed of an activity. We can just as easily use them during our natural conversation with the student in all manner of ways (to illustrate, to explain and to refute for example). never underestimate the students ability to engage in high order thinking. Their difficulty may be in the ability to express those thoughts, but that doesn’t mean they won’t surprise you if you give them the opportunity. It also displays how much you respect them as an individual, not just as a student. don’t be afraid of expressing your own opinions. Obviously you have to be able to read the situation and react sensitively, but in general my students are paying to have lessons with me and if I can, I will be myself. Conflict isn’t good, but conversation and the sharing of ideas is always healthy. You can read plenty more posts in this blog challenge. Go to Brad’s original post for links (here). Not only useful ideas, but challenging as well! I like it! Next Next post: ELTchat Summary by Edith Occelli – How can you teach Business English with minimal experience of being in the business world?